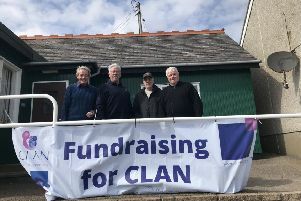 A group of Stonehaven residents has come together to raise funds for rugby legend Doddie Weir’s charitable organisation. The group, named Strive, is a joint effort by members of Stonehaven Cycling Club and Mackie FP RFC, with a series of events planned to raise £75,000 for the My Name’5 Doddie Foundation. The brainchild of Willie Tulloch, 43, originally from Orkney, the fundraising campaign will kick off with a five-day cycle from August 1-5. Undertaken in a relay format, cyclists will travel from Stonehaven to Inverness, then on to Perth, Glasgow, Melrose and Edinburgh, before returning to Kincardinshire. There will also be a small group setting off from Orkney on day one to meet the rest of the cyclists in Inverness, before continuing onwards together for the remaining days. Cyclists will stop off at a number of rugby clubs en route including Doddie Weir’s former stomping ground, Melrose. The cycling group is organising Doddie 5K Gump walks in the evenings to get families and friends associated with the rugby clubs involved. An eight-team rugby tournament will follow on August 25 at Mackie Academy, featuring rugby players past and present, and will be supported by a number of sideline fundraising activities. Local catering and specialist cask beer and craft gins will also be on offer. The campaign will culminate in a charity ball at Aberdeen’s The Marcliffe Hotel on Saturday, September 22. Doddie Weir is one of rugby’s most recognisable personalities, earning 61 caps for Scotland during a highly successful playing career. He represented the British and Irish Lions on their successful tour to South Africa in 1997, and won championships with his club sides, Melrose and Newcastle Falcons. He was diagnosed with motor neurone disease (MND) last year aged 46 and chose to make the news public on Global MND Awareness day in order to raise awareness of the condition. His charitable foundation was set up to raise funds to aid research into the causes of MND and to investigate potential cures. Willie Tulloch said: “Doddie Weir is such a great character and has done so much for the game of rugby over the years, both on and off the field. His motor neurone disease diagnosis came as such a shock and the way he has conducted himself since he made his announcement has been inspirational. “I was at Murrayfield for the New Zealand game last autumn when he took to the pitch to deliver the match ball along with his three sons. It was an incredibly emotional moment. It was at that point that I decided I wanted to do something to help raise funds for his foundation. “The support from the local Stonehaven community has been incredible. So many people have offered to help.